Getting married is a serious, lifelong commitment between two people in love. And planning a wedding is their first challenge in this journey. It will test their patience, multitasking skills, ability to compromise, and will to stay within their budget. Budget, of course, is relative. Some couples just want a simple wedding with family and friends; others opt for a lavish celebration with no expense spared. If planning a wedding is hard enough, planning a destination wedding doubles the work. Aside from coordinating everyone's schedules, there's the transport and logistics aspect to weed through. Still, it's one that many couples dream about and set to accomplish. Celebrities and prominent figures are known to prefer getting married far away from Manila, either because their chosen venue holds a special meaning in them, or, they want to have a more private celebration away from prying eyes. The most recent destination wedding among celebrities was that of Billy Crawford and Coleen Garcia. It was held at the Balesin Island Club in Polilio, Quezon. The island, it seems, has become a favorite among this set of people. Before Billy and Coleen, Heart Evangelista and Senator Francis "Chiz" Escudero, Cristine Reyes and Ali Khatibi, and Isabela Governor Faustino Dy and Mary Ann Dy were among the celebrity couples that tied the knot in Balesin. But apart from the physical distance, a secluded island with first-class amenities such as Balesin is definitely not within the reach of dreamy couples getting married on a budget. First of all, it requires private planes to get there, which also makes it impossible to make the celebration a one-day affair. At the least, it requires an overnight stay and a sensible three-day feast. There is a welcome party to get the wedding guests comfortable and, perhaps, a farewell brunch before everyone leaves the island, to say nothing yet of the wedding reception. 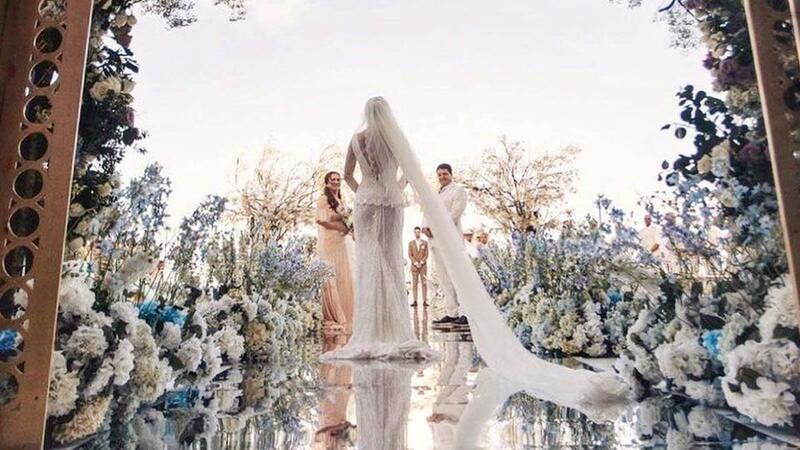 For a reality check, PEP.ph set out to find out how much a Balesin wedding cost. The Balesin Island Club, which opened in 2012, is a 500-hectare members-only luxury resort located 115 kilometers from Manila. It prides itself on having powdery-white sand and sweeping views of the sea, a global cuisine, and it offers their guests privacy and exclusivity. Boasting its one-of-a-kind concept, the resort features seven villages inspired by an assortment of seaside destinations around the world: Bali in Indonesia; Phuket in Thailand; Mykonos in Greece; St. Tropez in France; Costa del Sol in Spain; Toscana in Italy, and Balesin in the Philippines. Then there is the Royal Balesin Villa-a palatial structure facing Lamon Bay for a breathtaking sunset view. It houses 14 suites and is perfect for large celebrations. One needs to fork over at least P2.5 million to become a gold member of the Balesin Island Club and enjoy a free stay at the villa for seven nights. A diamond membership of P4.5 million entitles two member nominees to 14 nights of free stay, and a platinum membership of P6.5 million gives three-member nominees 28 nights. Members are then required to pay monthly membership dues, which they can also pay one-time, annually, at 10 percent discount. Interestingly, one does not need a membership to get married at Balesin. An endorsement from a sponsoring member is enough or through some other means such as a corporate endorsement. Typical of hotels and resorts, the Balesin Island Club offers wedding packages for its clients. According to its website, the Club's wedding package allows you a free villa night's stay, complimentary use of a four-seater golf cart on the wedding day, and a bottle of champagne or sparkling wine for the wedding toast. First-time guests are also treated to a tour of the island. Packages also include one's choice of ceremony and reception venues, breakfast buffet, and either a lunch or dinner banquet. An option to add a cocktail hour and open bar is available. Accommodations for the wedding guests are not included in the package, though the Club does offer a 15 percent discount on the rate of each villa-which can house up to four people—for a booking of more than 21 villas. Balesin Island Club does not have in-house wedding suppliers and stylists, so the package also does not cover the wedding ceremony and reception styling. For this piece, PEP.ph pegged a 250-guest count (all adults) for a three-day, two-night stay to come up with a ballpark figure of P7,351,000 for a Balesin wedding, inclusive of the 12 percent VAT and adding 10 percent service charge. Balesin Island Club has its own fleet of planes to fly the guests to the island. A round-trip fare for each person is P8,960. Upon inquiry, the resort charges P22,400 a night for each villa, but booking 21 or more villas decreases the rate to P16,800. A party of 250 guests needs 63 villas. The opulent Royal Balesin Villa, which groups 14 villas that can house 56 people, is available for a hefty amount of P336,000 a night. The first night costs P520,800, but the second night is slightly reduced to P504,000 because of the complimentary wedding villa for the bride and groom. A leisurely brunch is P873.60 per person and the welcome dinner is P1,545.60 per plate. Breakfast, a filling French buffet of crepes, omelets, baguettes, and Filipino dishes, can run up to P218,400 for 250 guests. Cocktails are served before a buffet dinner that features different cuisines served in the resort's restaurants, all costing P6,160 per person. The cost of an open bar-beer, wine, cocktails, and hard liquor-can go as high as P250,000. For reference, the price of a bottle of Johnnie Walker Platinum Whiskey at Balesin Resort is P11,200 and a bottle of Dom Perignon Champagne, P17,584. Local beers range from P123 to P157 a bottle, while imported ones from P235 to P403. The Balesin Island Club offers 11 indoor and outdoor ceremony venues located in the different villages of the resort. These are the Balesin Chapel, which can be rented for P8,960, the Balesin Spa and Balesin Sala, Mykonos Cove Deck, the poolside or gardens of Bali, Phuket, St. Tropez, and Costa Del Sol, the Toscana courtyard, and Rico's hideaway which all rent for P16,800 each, and the Royal Balesin Villa at P84,000 for four hours of use. Likewise, the resort also has 11 indoor and outdoor venues for the reception, with function rooms that accommodate a party as small as six persons and as big as 200 persons. Each village venue charges a consumable rate of P16,800 for four hours and P1,680 every succeeding hour. The opulent Royal Balesin Villa, on the other hand, costs P84,000 for four hours (venue only), and P5,600 for each succeeding hour. Use of a projector, screen, and basic sound system for both the ceremony and the reception costs P11,200. Upgrading to full lights and sound system during the reception will up the charge to P53,200. Destination weddings, especially island ones, require further logistics for the transport of materials and equipment to be used at the wedding. This includes, but not limited to, flowers, backdrops, tents, and stages. For this, Balesin Island Club offers a truck's one-way trip from Real, Quezon to the resort via a roll-on-roll-off ship. Manpower assigned to set-up the flowers, backdrop, stage, and the like have separate accommodations and crew meals. For a wedding supplier's staff of five, boat trips, meals, and room rates amount to P14,784. Now there are still other wedding expenses such as the bridal gown (Israeli designer Galia Lahav's ready-to-wear line retails from $6,000 or P300,000), the groom's suit or tux (Edwin Tan charges between P25,000 to P45,000), a wedding planner (La Belle Fette Weddings & Events' packages range from P85,000 to P150,000), and an event stylist (Gideon Hermosa's event styling packages start at P300,000). There's also the matter of hiring a photographer (top-caliber ones charge around P300,000 for a full-wedding package), a videographer (industry greats offer packages upwards of P200,000), a hair and makeup artist (celebrity makeup artists have packages at P50,000), buying wedding rings (platinum rings can start at P75,000 per pair), bridal shoes (Christian Louboutin So Kate pumps retail for $725 or P36,795) and invitations (full suites start at P200 per set or P50,000 for 250 guests). Most people may balk at these prices, while this is change for others. A wedding, after all, is a once-in-a-lifetime event, and pulling out all the stops is nothing for a special day with the love of your life. As they say, different strokes for different folks. And then there are the couples who want a posh wedding simply because they can.